Imagine out of nowhere your 16 year-old daughter or son has a severe mental breakdown and needs to be hospitalized in a psychiatric facility. At first, the doctors tell you that your child might have schizophrenia, but they need to try different medications and treatments to confirm. You are asked to sign a waiver that reveals a disturbing list of side effects that could occur. There is no internet, no well-known books on how to deal with this, and no celebrities that have gone through this to show you how. This is what my family faced when I was hospitalized 21 years ago at the age of 16. Want to know the simple strategies my family used to help me fully recover? 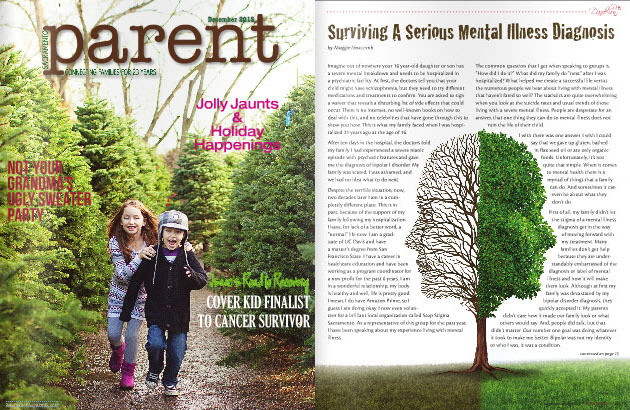 Click here to read the whole article in the December issue of Sacramento Parent magazine (pages 21 & 23).